To include the "exact same functionality"
NBA Playgrounds looks like a promising release for next week, with some recent demo events bringing impressions and footage of the game to the web. With regards to the Switch version, however, we've been a tad nervous due to Nintendo's own official gamepage pointedly avoiding any reference to the game's online play; naturally there were fears of Nintendo gamers missing out on a key feature. Thankfully that won't be the case. We checked with the developer's representatives and it's been confirmed to us that the Switch will have all of the online features, the only difference being that they'll go live a few days after the launch. Evidently Saber Interactive couldn't quite get the Switch code for online features over the line for the final submission to Nintendo, hence the update later next week. 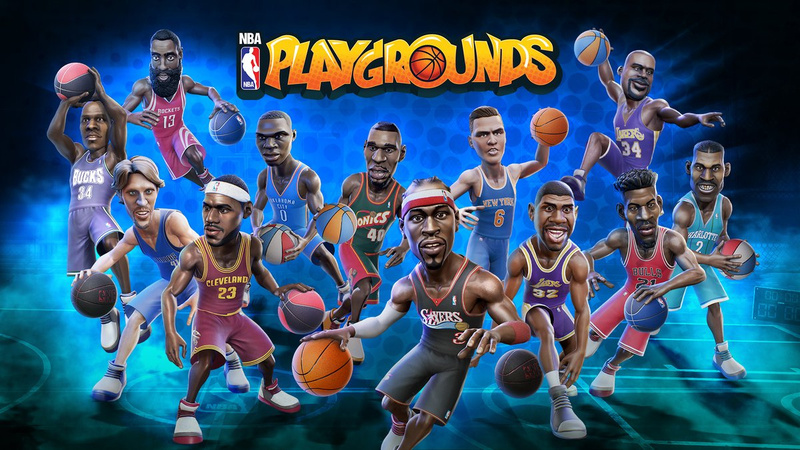 The online play for NBA Playgrounds Switch will *not* be available at launch – it will arrive a few days after launch via an update. Once this update comes out, the Switch version will have the exact same functionality as the PC, PS4, and Xbox One version – this means you can connect with people online and play against them 1v1, and there are online leaderboards. However online tournaments will not be up and running at launch for any platforms, this functionality will come at a later date via an update. We’ll share details on timing for the online tournaments as soon as we get it. The developer has already previously stated that 2v2 matches and regular event Tournaments will be post-launch additions, so in that case Switch is on the same court as other consoles. The game is due out on 9th May and naturally we'll work on a review to let you know what we think. Do you think this will be a slam dunk? I'll enjoy getting the game at the same time as the other systems for once. As for online I like to get use to a game anyways before going online so that's perfectly fine! Don't care about online but I'm eagerly awaiting reviews to see if this is a worthy successor to NBA Jam!!! More sloppiness. Finish your game properly before you release it please. What is with that art style? Good news, I was a bit nervous as well. I really want this game to be good, it fits a perfect spot to the Switch's play anywhere local coop! @SLIGEACH_EIRE Actually this delay of online function is most likely Nintendos fault. It's also only a few days. No biggie. I have really been enjoying the NBA jam on Wii. Such a great game. Brings back memories. Does anyone know what the uk price will be ? Can you play as Larry Bird? @SLIGEACH_EIRE I don't really see a problem with it, it's not like they're ignoring a large problem at launch. It'll be taken care of in 2 days. They're being very transparent about the game which is a good sign. @crackafreeze @CartoonDan the devs have said they will add more players after launch, but I don't know if Larry Bird will be one of them. There are a lot of historic players though so maybe? I so can't wait for this game. @ThomasBW84 Thanks for putting the time in to get these details about the online play for us!!!!! @crackafreeze I'm hoping for the best, I love NBA Jam so really want this to be good. It has elbow throwing, so fingers crossed! @Fred13 I'm not sure, we're hoping to snag a Switch code for review so our aim will be to cover stuff like that asap. The game page on the eShop shows that tabletop mode is supported, but whether that means we can play with one Joy-Con each or not isn't necessarily guaranteed. @ThomasBW84 if topic but when are you guys planning to publish an article on this weeks 🇯🇵 charts? @SLIGEACH_EIRE I think that this is Nintendo being dumb rather than Saber not getting their stuff together. Saber themselves have been awesome about being open to the community about this game and should absolutely get some goodwill. @Mr64 My only complaint is the redundancy of types of games coming. I would like to see some long-form games coming that have a little bit more in the way of storytelling and presentation. My girlfriend and I are spoiled for games to play in groups (Puyo, MK8, Snipperclips) but the single player seems to be lacking beyond tough as nail score chasing games like Graceful Explosion, Isaac, and Tumbleseed. I would do some terrible terrible things to take Darksiders on the go with me. @Indielink You "think" that it's Nintendo being dumb. Could it maybe be that Saber didn't have the online ready in time and didn't want to postpone the release?!? It's always so easy for you guys to "blame" Nintendo for everything. So damn much whining. @Amsterdamsters there is a good reason for this hypothesis tho. In the past Nintendo has rarely let small developers use their servers. Sony and Microsoft have been championing this for years so they have a better structure for small developers to utilize their services. It's just facts. Cause people wanna point the finger and place blame for everything nowadays. Sometimes things just happen. It's no one's "fault", it's just the way things worked out. Nintendo in no way is to blame for this developer's game. And this developer likely had the release date locked in with Nintendo, but online missed the submission date by 2 days. It is what it is. No one is "to blame"
I'll wait for a Switch review and for when online becomes reality then. @faint Though Saber said that the patch would be just a few days after the game is released. Is it going to take that extra few day for Nintendo to just decide to open their servers to them or could it be that the online portion of the game for the Switch just wasn't ready in time when they submitted the game for approval?!? @JaxonH That's what I was saying too. Sadly, there's just too many whiners in these forums. @Amsterdamsters or could it be Nintendo has a much smaller number of employees work with third party's for online access then Sony a Microsoft do? Could this cause a delay? Yup. Is this game eShop only? I have been poking around and I can't find a physical copy to order. @Amsterdamsters Dude, I defend Nintendo for almost everything that they do, but it's fairly common knowledge that their online system is not the best. That's totally a valid reason for it not being ready in time. I'm not whining about anything, nor do I blame Nintendo for everything that happens, so please chill out. Quiz time: try to name all of the players in the above graphic. I think I can name all but one or two. @SLIGEACH_EIRE ha, where have you been? Can you play local 2-4 multiplayer on two switches with this? I'll wait then on a possible purchase until I see all 3 versions in it's entirety. Forgive my ignorance but is this an EA published title? It'll give us time to practice I guess! Has anyone played this? Does it play well from a gameplay stance? Is it like playing NBA jam? Because I would love for this to be as awesome as nba jam still is. Even Wii version is great. @ThomasBW84 Thank you for your continuious hard work for us, keeping us up to date. @SLIGEACH_EIRE No sloppiness here. You just don't know what you're talking about. Has anyone played this yet? How is it? Graphics? Framerate? Considering the following statement, it's more likely that the devs were behind on some features for all the consoles (platforms), and more so on the Switch. "However online tournaments will not be up and running at launch for any platforms, this functionality will come at a later date via an update." Not to mention that 2v2 is missing for all of the platforms also. I'm not too worried in this case as it's a digital game anyway. But this stuff annoys me when it's a half finished physical copy of the game which gets dlc updates to finish the game, that are of course never on the physical card (ie it becomes basically just a digital game that still needs the disc/card for authentication to play)... that's what will bring the death of physical media more than anything... but not the case here anyway. @faint I'll take a look on Friday, certainly. I hope so, I loved NBA Jam and Hangtime. Fabulous news, a Nintendo port that'll be treated exactly like all the other ones! Definitely adding this one to my collection! It's a shame the graphics on the switch version aren't as polished as the Xbox and ps4 game. I'mean there's no character shadows, no depth of field or motion blur...And overall looks pretty dull in comparison. I wouldn't have thought this game would test the hardware of the switch?!? Especially when we have visually stunning games like MK8D running at 1080p. Hopefully Saber will address it in an update.